An employee examines a Renault car at a dealership in Moscow. Renault is currently the best-selling foreign brand in the market. 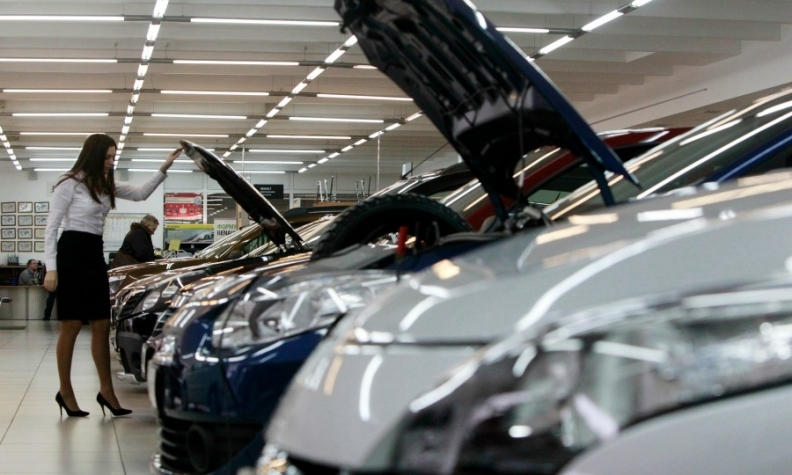 Russia's new-car sales are forecast to grow 10 percent this year as the market recovers faster than expected. March sales increased by 14 percent to 157,279, the twelfth consecutive month of growth, the Association of European Businesses (AEB) lobby group said. Through March sales are up 22 percent to 392,920. The market is recovering from four consecutive years of decline as the economy returns to growth. But annual vehicle sales are still well below a peak of nearly 3 million reached in 2012. "AEB members forecast total market sales to improve by about 10 percent compared to 2017, to a level of 1.75 million units," Joerg Schreiber, chairman of the AEB automobile manufacturers committee, said in a statement. Nearly all major brands showed significant rises last month, with Mitsubishi seeing the biggest gain as sales tripled to 5,227. Sales at Skoda rose 34 percent, Kia gained 31 percent and Ford registrations increased 25 percent, a rise matched by Renault. Volkswagen brand rose 24 percent, while market leader Lada was up 22 percent. Hyundai sales rose 17 percent. Download PDF, above right, for March and 3-month sales by brand, automaker and group. Bucking the upward trend, Nissan sales were down 21 percent and Toyota saw sales drop 8 percent.